Skottie Young started his work as a cover artist. And he did a lot of them. Easy to remember: they were the baby Marvel characters. And while I’m sure that was fun, we got to see the real Skottie when he did his “I Hate Fairyland” series. It was irreverent as well as extremely fun. When I saw that he had signed on to do Deadpool I was excited. Deadpool hadn’t been handled properly for some time, however, he did the character right and handed out the fanservice appropriately. Now that Fairyland is over, Skottie has teamed up with his old cohort Jean-Francois Beaulieu to churn out a new original story. First of all, I’d do a disservice if I didn’t talk about the look of this book. Mike Huddleston’s cover is frameable. This might be the most beautiful cover I have ever seen in a comic book. The variants are cool, too. There’s a 1:10 variant by the story artist as well as a 1:25 variant by Skottie himself. Huddleston will continue to do the main covers for the foreseeable future. And that’s just fine for me. When you do stop staring at the cover, you open the book to pure eye candy. Jorge Corona’s art combined with Beaulieu’s colors might be the combination of the year. The inks and color blend so effortlessly to create a vivid pallet. I read this a second time through without looking at the dialog – something I do to test the effectiveness of the art. This is one of the few times where the art carries the story to about a 90% understanding of the story. The mood shifts between daytime and nighttime scenes are spectacular. During the day the blues and greens are stunning. However, the evening is where most of the most dramatic stuff happens. Without giving it away, the “weather” scenes are sweeping and charismatic. As with Skottie’s recent projects, the story tends to be a slow burn. You are rewarded in the end. Some of the early reviewers complained about the story giving up too much in the first book. I think it’s just the perfect amount. Character development with a touch of what’s to come. Perfect in my books. 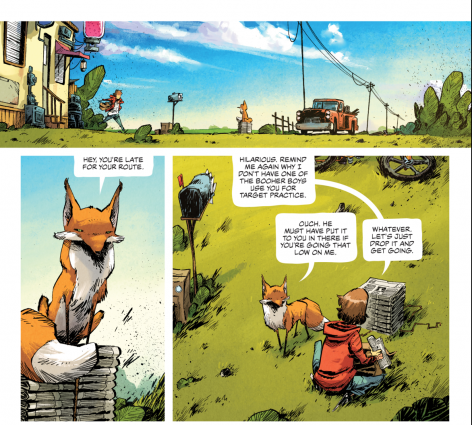 The lead character Abel is relatable and the fact that he knows a talking fox is not at all jarring. The dialog is smooth and easy to read. I just cannot gush over this book enough. It’s not a perfect book. There are a couple of cases of profanity in the book, but nothing the kids nowadays haven’t heard before. But just like the lead character, you can’t grow without imperfections. 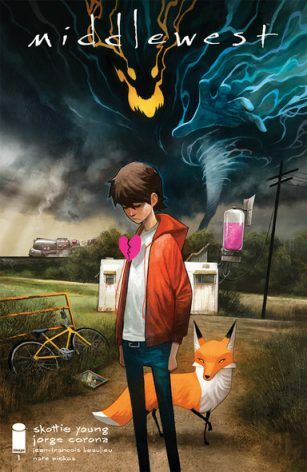 There’s a ton of heart in this book and we can see the fantasy aspects on the horizon. Book of the year contender here!